Thought: True leaders have people follow them out of will -instead of obligation. 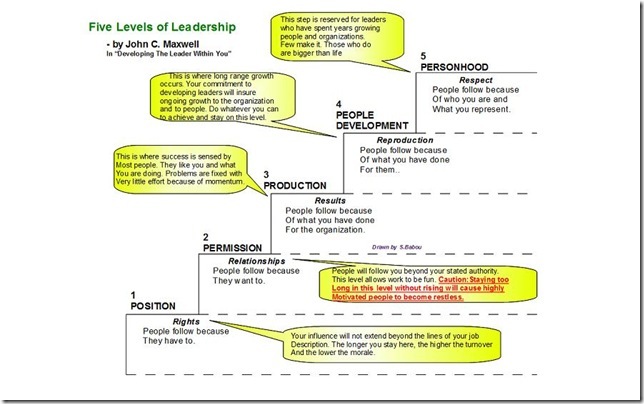 1) Please explain (in your own words) the five different levels of leadership. 2) How have you seen "level 1" leaders reach the height of their incompetence as leaders? 3) What would "level 1" leadership look like in a church? 4) When dealing with a leader, how would being able to identify where they are among the 5 levels improve your communication with them? 5) List a Bible verse, character, parable, etc. that demonstrates one of the 5 levels of leadership.